Washington (CNN) - John Kerry thinks President John F. Kennedy's assassin had help. As the 50th anniversary of Kennedy's assassination approaches, Kerry made clear that he does not agree with the conclusions of the Warren Commission, which found Lee Harvey Oswald acted alone. "To this day, I have serious doubts that Lee Harvey Oswald acted alone," Kerry told NBC's Tom Brokaw, in a report timed to coincide with the anniversary of the tragedy in Dallas on November 22, 1963. On NBC’s "Meet the Press," host David Gregory asked Kerry to elaborate on the statement. 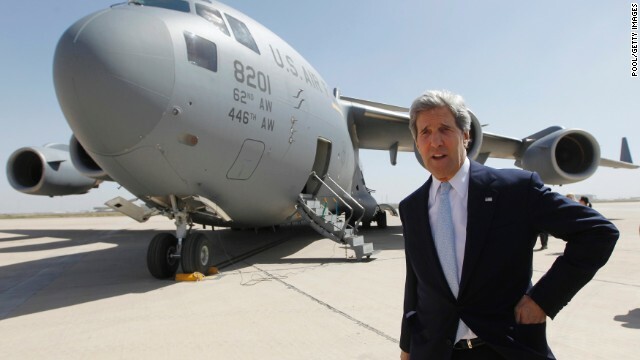 "I’m not going to do more than say that it’s a point of view that I have," Kerry said. Kerry met Kennedy in 1962, when he was working as a volunteer for his brother Ted Kennedy’s senatorial campaign. Kerry visited the White House and was promptly treated to a sailing trip around the District of Columbia with the leader of the free world. It's a question likely never to be answered. But what a nice place this could have been had he been allowed to serve out his first term, then be reelected in 1964. My God, what we missed out on. What a shame. And yet he believed the lies Obama told about the ACA? Why do we dig deep into the past? The CIA killed Kennedy and George Herbert Walker Bush was the man who coordinated it. Read Gerald Posner's book Mr. Kerry and learn how Oswald acted alone. Sad and sensless that a single man could change history. Posner's book is full of holes. All of the actual evidence points to at least 4 gunmen, Oswald may have been involved, set up by the CIA, under LBJ's orders. And then, as Nixon said "the mother of all coverups." When the Warren Report was issued is when most Americans figured out the government will lie to you. @Gurgyl–In hopes that we do not repeat the same mistakes. However the GOTP just rewrites the past to suit. At one point I thought right wingnuts would accept the truth and stop their lies. I was mistaken. Do we really need to know that LBJ had a part in it? Fix the ACA mess first before digging up 50 yr old stories. I remember the day President Kennedy was killed. I was in college at a laundromat doing my laundry, and two RWNJs came in cheering that Kennedy was dead. I began to realize that most RWNJs were sick people. Would someone please cite an instance when a republican was correct? I served in Viet Nam too but didn't turn my back on the people that did like Kerry. Only person I know that turned in the paper work in for a himself Purple Heart because his Commanding Officer didn't think he had he earned it and that was number three and a ticket home wonder about the first two now we didn't ask for a Purple Heart like Kerry did such a jerk. A word of caution to the Warren Commission believers: Oswald was never tried in a court of law. What does that mean? Well, it means that the "lone gunman" theory is just that: another theory, no more compelling than the others. The Warren Commission consisted of political appointments, some of whom were JFK's enemies, like Allen Dulles, who was fired as head of the CIA by the President. It was a political commission, not a proper trial by judge and jury. I'll also feel free to believe my own eyes: the Zapruder film clearly shows that the final shot came from the front. If Oswald participated, he had help. About a decade ago, some computer artist tried to demonstrate that the "magic bullet" actually did hit Kennedy and Connally just the way Arlen Specter described. Problem is, we in tech have a word for that: "GIGO" - Garbage In, Garbage Out. You can make a model demonstrate anything you want to, if you program it correctly. Our country was never the same again after November 22, 1963. Never the same again. So many people wanted JFK dead , it's hard not to believe in a cover up. A modern day Julius Caesar with out Brutus. Well, Conspiracy Theories make a helluva lot better copy than the simple truth. Oswald did it and acted alone. I don't know of a political assassination that there was a conspiracy. It is amazing the concocted stories out there. Let us not forget that Kennedy launched the Bay of Pigs invasion. Was there ever a more blatant abuse of US power. The Cuban Missile crisis where the world was almost destroyed. The over throw of the Dhiem Government in Vietnam which was approved by JFK. Which led to Dhiems assassination and the widening involvement of the United States in Vietnam. A war that eventually Kerry protested against. Does anyone really think that Kennedy would have been that different than LBJ . On domestic issues he would have been far more conservative. With respect, John, nobody gives a fat rat's what you think. It seems that our leaders are more worried about the past than the present. Get to work and help us get through the current mess. The Warren Report is one classy production that always reminds me of El Salvador, and some other lawless clout. America should go spiritualism, invite witchcraft, prophets, whatsoever to solve the JFK's death. But for now Warren Report should remain popular as the biggest cover up report history ever known. Kerry is right,many Americans know that. The film clearly shows him being shot from in front of the car. Knowing and having worked with one of those involved with the Warren Commission I tend to agree with him.